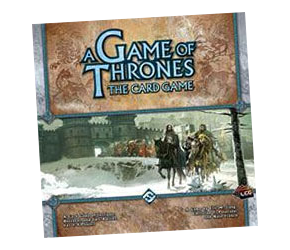 Players take control of the Starks, Baratheons, Lannisters, or Targaryens and attempt to plot, fight, conspire, manipulate, and bribe their way to victory. This endlessly engaging Living Card Game (expansion sets are a fixed number of cards of the same type; no random collecting) has won two Origins Awards, and FFG run regular tournaments. Players assume the leadership of one of the great houses of Westeros, each with a different play style, and by exercising military might, intrigue, or diplomacy, they compete for power. In addition, a special plot deck brings in thematic effects that can greatly affect the game. The game can be played by two players or more, and with three or more players, each chooses a role at the start of the each round which engages with the other roles in interesting ways. The great thing about the game is that it acomodates a whole range of different playing styles, whether you prefer military conquest, diplomatic manoeuvring, or underhanded scheming … and with many deluxe expansions ‘Chapter Packs’ of 60 cards each, there’s a lot of variety on offer.